This is not really an essay on the Dipnoans, but rather one of the periodic rants about methodology which appear from time to time in these pages. By way of excuse, we will begin with a brief discussion of Schultze 1994) which has at least something to do with the Dipnomorpha. Prof. Dr. Hans-Peter Schultze is one of the relatively old hands in the dead fish area. He began working in the field in Germany in the 1970's. Schultze has the distinction of being one of the very early converts to cladistic methods in vertebrate paleontology. As early as 1981 he published an article entitled Hennig und der Ursprung der Tetrapoda ("Hennig and the origin of the Tetrapoda").. For some time, he was a professor at the Museum of Natural History at the University of Kansas. More recently, he has returned to Germany as Director of the Institut für Paläontologie at the Museum für Naturkunde (MFN) at Berlin's Zentralinstitut der Humboldt-Universität zu Berlin. Hans-Peter Schulze. However, we are here concerned with an article which Schultze wrote back in in Kansas in 1994: Schultze (1994). Just as he was one of the first to recognize the importance of cladistic methodology, Schultze was also one of the first to recognize some of its problems. At the time of the paper, he was concerned that different workers were obtaining radically different results for the Sarcopterygii using very similar methods -- even very similar character choices. In order to determine what might have gone wrong, he took a second and more detailed look at the precise characters and scoring used in seven different studies. In order to both simplify the approach and to make the studies comparable, he restricted the work to only a few groups. Rather than use metataxa or morphotypes, he appears to have used "the basal taxon of each group" as a proxy for the clade. I am not convinced that this is good methodology, but it made little difference to the result as we shall see. Some characters were provisionally rescored, although it is unclear how systematically this was done. Again we will see that this makes no difference. Having made all seven studies directly comparable, Schultze then re-ran the studies using the same characters used by each author. In each case, he obtained results which were almost identical to those in the original study. The results remained almost the same whether he used original or revised character scoring. I believe the differences between the cladograms is [sic] caused by preferences in the selection of characters that favor the proposed hypothesis. However, the investigator(s) may not have been conscious of this bias. In this manner, a disproportionally high number of characters will be included that support those biases. Id. at 163. In reaching this conclusion, he spares no one, and in fact concludes that one of his own previous studies was among the four worst offenders. This is a very interesting study, and beautifully carried out, but it is not so clear that its conclusion is correct. Interestingly, immediately after the foregoing remarks, Schultze makes some perceptive remarks about homology. In particular he notes that one of the key characters which has driven differences of opinion in this area is the homology of the posterior internal nares in various Sarcopterygian groups to the choana of tetrapods. However, he abandons that line of thinking fairly quickly and simply adds that "initially hypothesized homology" as well as character selection influences the result. Id. at 164. Ultimately, he resorts to a sort of "total evidence" approach. Kluge (1989). Here, Schultze may have gone the wrong direction. Scoring characters requires an initial hypothesis of homology. "Total evidence" does not enable the investigator to abdicate this responsibility. If the posterior nares is homologous to the choana, it must be scored as the same character state. If it is not homologous, it must be scored as a different character state. If the investigator cannot determine homology, then it must be scored as missing data. "Total evidence" is not an excuse to score mere similarity as homology. This point bears some emphasis. It is not possible to be agnostic on matters of homology. If I score two organisms as having the same character state, the parsimony algorithm will treat them as if no change were required to move between them. If I make this call based on similarity alone, without considering homology, I will get wrong results. Cladistics is built on the assumption of parsimony. Parsimony makes sense only if we are moving between homologous states. There is simply no getting around the fact that an appropriate cladistic study begins with judgment calls about homology. As a result, if my underlying belief is that the posterior nares of dipnomorphs are not homologous to choanae, I may not be justified in using the character "choana present" in a high-level study of sarcopterygians because it will be an uninformative apomorphy of tetrapods. Thus, character selection in a cladistic study is necessarily influenced by a priori understndings about homology. With that said, it is also possible to go overboard in the other direction. "Homology" is a little like the legal concepts of "equal protection" or "obscenity." It absolutely defies precise definition. As recently discussed by Hutchinson 2001: 128-130), homology is actually a combination of a number of concepts, including similarity, conjunction and congruence. Certainly similarity, and probably the others, require some level of subjective judgment. By asking too much of any of these elements, we can destroy homology. Thus, we may be a little cautious about work such as Rieppel & Zaher (2000). This is one of several papers in which Rieppel and co-workers have taken issue with the work of MSY Lee, e.g. Lee 1997a). While Rieppel & Zaher demonstrate an absolute mastery of lepidosaur braincase anatomy, it is possible that they demand too much of similarity. These workers insist that similarity "is rooted in the establishment of topological equivalence." But what is "equivalence?" By ever finer parsing of anatomy, it is always possible to reach a point at which structures lose similarity. After all, the whole idea of homology is "the same, but different." Like knives, conceptual tools lose their value if they are sharpened too seldom or too often. Homology is a powerful tool, even if we do not yet fully understand its biochemical meaning and must rely on good judgment. But the necessarily judgmental element cannot be ignored under the guise of "total evidence" any more than it can be deconstructed by demanding complete topological correspondence. ATW 010203. Schultze, H-P (1981), Hennig und der Ursprung der Tetrapoda, Paläontol. Z. 55: 71-86. Ahlberg & Johanson (1998); Hutchinson 2001), Janvier 1996); Kluge (1989), Lee 1997a), Rieppel & Zaher 2000), Schultze 1994). Dipterus. Artwork by Nobu Tamura, 2010. Wikipedia, GNU Free Documentation/Creative Commons Attribution license. Range: Early Devonian (Lochkovian - Pragian) of South China. Phylogeny: Dipnomorpha:: (Diabolepis + Dipnoi) + *. Characters: Less than 30 cm long;small, non-standard bones flanking paired dermal skull bones; inward and downward bending snout; premaxilla small & independent, with high anteromedial portion and low posterolateral portion; sutures always visible between premaxilla and the rest of the frontoethmoidal shield; ethmoid relatively large and not fully separated from otico-occipital; all nares ventral as in Diabolepis; posterior nares at posterior end of premaxilla and lateral rostral; eyes small; pineal opening absent, with small "mound" in analogous position (contra another web source, indicating pineal foramen at the anterior margin of parietals); extratemporal bone present; postparietal laterally flanked by more than two bones and posteriorly overlapped by the extrascapular; jugal larger than lacrimal (as in Dipnoi); compound cheek bone plate corresponding to squamosal + quadratojugal + preopercular); intracranial joint situated at the level of the trigeminal exit (contra, another web source, stating absence of intracranial joint); posterior face of ethmosphenoid facing posteroventrally; anteriorly-placed ethmoidal articulation [ZY02]; parasphenoid large and long; dermal bones with thick, smooth layer of cosmine pierced by small (25-60µ) pores; pores larger (75-100µ) on lower jaw; rostrum and lower jaw with numerous rostral tubules; enamel penetrates pores (a porolepiform trait); Westoll lines absent. The Journal of Vertebrate Paleontology Psarolepis abstract); ... Chinese & English -- extended abstract); JVP 22(3) September 2002—ABSTRACTS 31A; ???? ?- ?? Chinese). Campbell & Barwick (1995); Chang & Smith (1992); Janvier (1996); Long 1995), Zhu & Yu (2002) [ZY02]. Dipnomorpha :: Dipnoi + *. Prominent snout; cranial joint absent; teeth dendrodont; maxilla absent (? ); premaxilla retained and bears teeth internally (i.e. no marginal teeth); premaxilla excluded from orbit; dentary tooth- bearing; dentary reduced & anterior; tooth plates for duraphagous diet; vomers in contact ?! ); parasphenoid contacts vomers; teeth on pterygoids and prearticulars; long parasphenoid; separate entopterygoid tooth plates (large toothed flanges on either side of parasphenoid -- not shown in figure); dermal cranium fused and partially redivided on dipnoid pattern; palatoquadrate not fused to braincase; posterior nares at posterior end of premaxilla and lateral rostral; skull roof flat on braincase; pineal opening absent, with small "mound" in analogous position; B bone present; calcified cartilage present (as in some dipnoans); cosmine covering, and enamel penetrates pores (a porolepiform trait); Westoll lines present. Links: Diabolepis (abstract of article critical of Chang's work). Campbell & Barwick (1995); Schultze (1994); Chang & Smith (1992). Image: combines 3 figures from Chang, M-M & X Yu (1984), Proc. Linn. Soc. N.S.W. 171-184, vide Carroll 1988: 149, fig. 8-14(a)-(c)). ATW040106. Dipnomorpha :: Diabolepis + *. Large tooth plates from entopterygoid & prearticular; network of tubules inside snout and lower jaw symphysis with dermal pores unique, perhaps electroreceptive, "Fahrenholz" organ? ); nares usually open ventrally at oral margin and inside mouth; no maxilla or premaxilla; deep lateral pit on anterior portion of lower jaw, between dentary and prearticulars, with floor of Meckelian bone and neural and nutrient foramina; vomers may be present, but ectopterygoids, palatines, & coronoids fused to tooth plate or lost; parasphenoid reduced anteriorly; fusion of palatoquadrate & undivided cranium; dermal bones of snout fused as ethmoidal shield, or re-divided in completely non-standard pattern; no intracranial joint or ethmoid fissure; short pre-orbital skull; no normal branchiostegal rays; 'B' bone separating parietals and post-parietals; braincase strongly attached to skull anteriorly; separate pineal & parapineal canals; notochord penetrates only slightly into braincase; primitively, well-defined gill arches (extensive use of lung, estivation began in P forms); opercular & subopercular large; neural arches between centra, but hemal arches on centra; post-Devonian species show progressive loss of ossification; pelvic girdle with large pelvic plates, probably fused; pectoral and pelvic fins elongated but poorly known -- perhaps similar to porolepiforms; 2 posterior dorsal fins; primitively, typical sarcopterygian rhomboid cosmine scales; scales bear unique, concentric "Westol lines;" heart with partial ventricular septum & separate pulmonary circulation; cosmine present; enamel penetrates pores of pore-canal system; odontodes buried in cosmine present. Probably exclusively marine gill-breathers until Carboniferous. These, and later forms developed extensive, sometimes obligate, lung breathing and underground estivation during dry seasons, or even dry years. Entrez-PubMed; Entrez-PubMed; Entrez-PubMed; Devonian Times: Lungfishes; Sagenodus and the beginning of modern lungfish; Introduction to the Dipnoi; dipnoi; Devonian Times: Lungfishes; Lungenfische German). Campbell & Barwick (1995); Schultze & Chorn (1997). Images: (1) Unattributed Neoceratodus from dipnoi 2) modified from Schultze & Chorn (1997) to show general pattern of cranial bones. 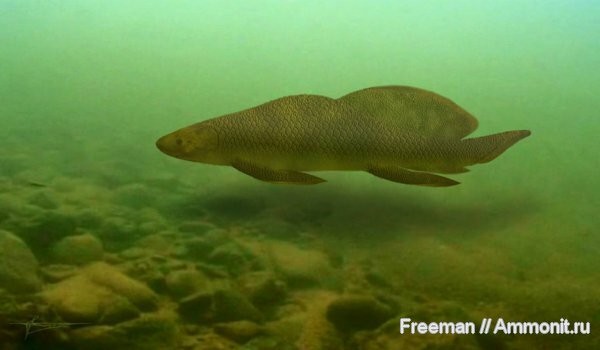 The full article is reprinted at The Permo-Carboniferous genus Sagenodus. 010403.